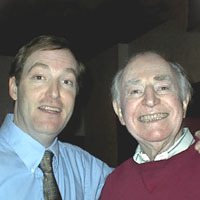 My father was the real Wizard in my life, along with Johnny Hart - his long-time partner on the Wizard of ID. They are both in heaven now in that special place where the cartoonists hang out. Sometimes I can still hear them laughing up there... or arguing. They were both passionate about their cartooning. I never thought I'd be drawing and co-writing the Wizard of ID. When I was a kid I wanted to be a football player, be in a motorcycle gang, or join the circus. Instead, I ended up working with these two nuts, which was kind of like joining the circus so I guess it all worked out. I loved the outdoors (still do). In high school I worked for the county park system. In college I studied forestry. I did tree work (way up high, clearing the way for power lines in what used to be the “country”). Later I worked as a union and non-union carpenter in California, Washington DC, Baltimore, and Annapolis. Don't get me wrong…I also did some drawing. I spent a lot of time doodling on the desk when I should have been paying attention in school. I must have been learning from my father all along. How could I not? He drew pictures on his napkins at the dinner table and spoke about the Wizard and the King as if they were real people... It was part of my life. As a result of my active lifestyle (including a motorcycle accident), I suffered a few minor knocks to the head, which might account for why I said yes when my father asked me to join him in his studio in 1986. It was the start of whole new adventure with the two Wizards (Brant & Johnny) as my mentors. In 1990 I met Nicola (who later became my wife). She joined the team bringing along her artistic talent, her digital bag of tricks and most importantly her sense of humor. My father and Johnny called her "the glue." My wife and I feel very fortunate to continue drawing and co-writing the Wizard of ID. We collaborate with the Hart family, especially Mick Mastroianni (Johnny Hart’s grandson) who’s doing a good job as new head writer.